Positive material identification or PMI is the verification of metal alloys based on their chemical composition. This methodology is used for a wide range of applications where the grade of metal alloy used in a particular application needs to be confirmed. PMI is used in a wide range of applications, but most commonly in industrial settings where using the wrong metal alloy grade can result in premature corrosion or even failure creating a potentially serious safety hazard. The chemical verification of alloys already being used in industrial applications often requires that the analysis be non -destructive and performed insitu. We offer a wide range of metal alloy reference materials for PMI applications which are available as 38mm diameter discs in varying thicknesses appropriate for handheld XRF or OES instruments. We have over 400 different materials covering everything from the most common steel grades to more exotic Nickel and Titanium alloys. These PMI standards or “XRF Coins” are available as individual pieces or in larger sets. Titanium and Aluminum alloy sets are available upon request. 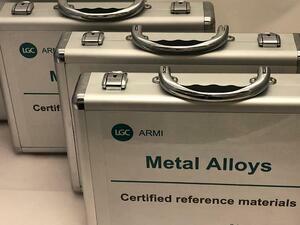 We also offer a comprehensive Master Alloy 100 set for the most demanding applications.